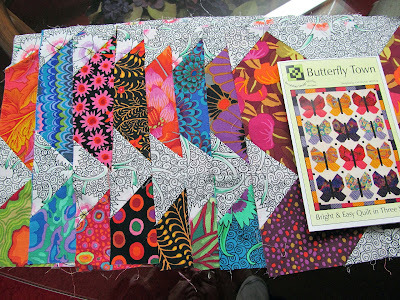 I am looking for more butterfly fabrics so I stacked the finished blocks with a little showing of each so I won't cut any duplicates. I laid the photo from the pattern there too for inspiration. I decided to be cutting for 2 projects so I needed to start in bin #3 for the other project. This is what is in that bin. The pieces are folded approximately 9" wide and the folded 11" direction goes top to bottom in the bin. The other project is the 2.5" squares of the Kaffe fabrics. You can read about it here. 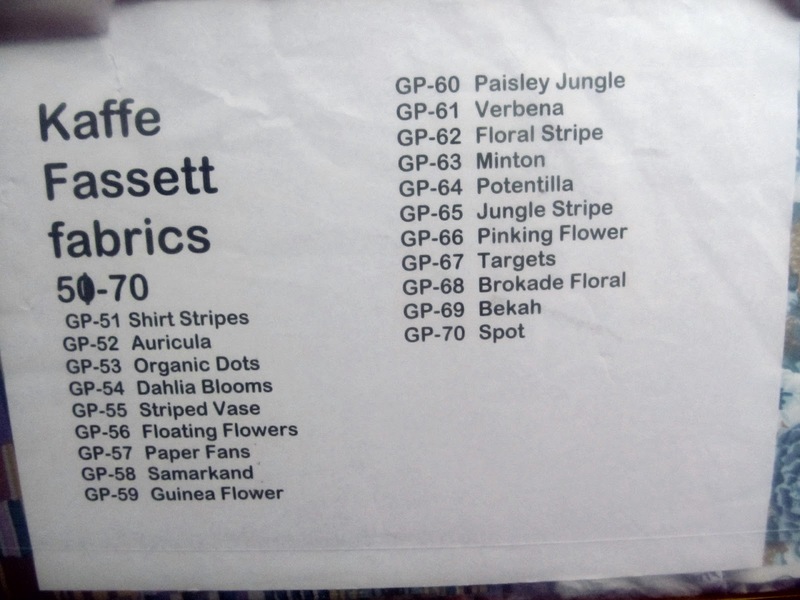 I have an inventory list printed with the name and number of every Kaffe fabric. 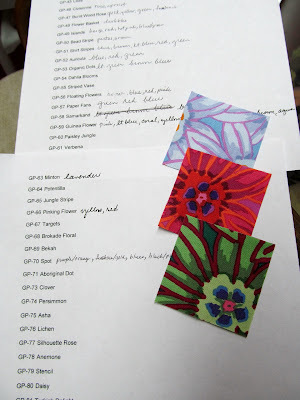 I am writing down the colors that I cut of each fabric. I'm not cutting the large prints into the little squares. This is Potentilla which is #64. 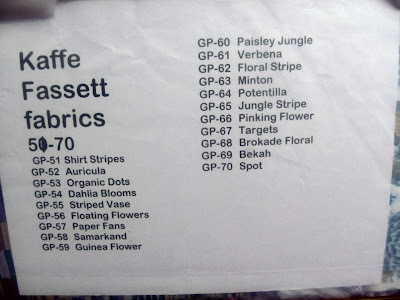 Kaffe's fabrics current fabrics are up in the 160s so you can see I have a way to go. 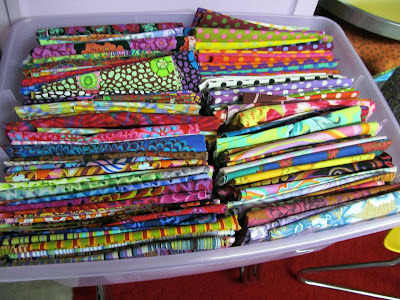 I have 196 different fabrics cut into squares so far. 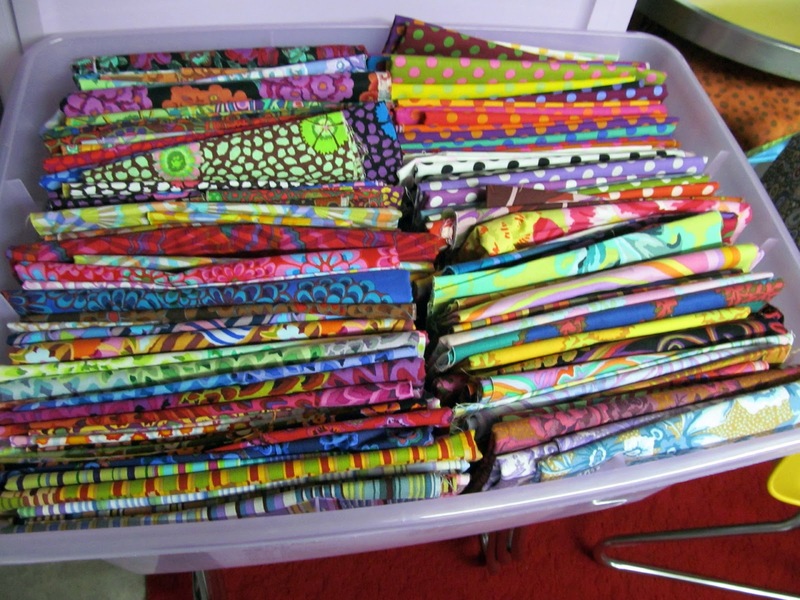 I can't believe how painstakingly you have organized and used the Kaffe fabrics. 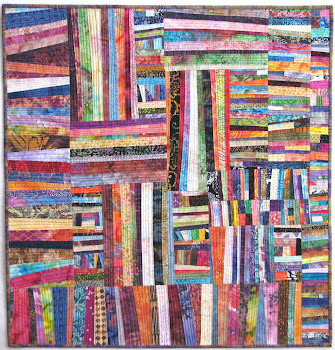 There is so much just plain hard work and patience invested in your quilts. Oh...that butterfly pattern is calling my name !!! 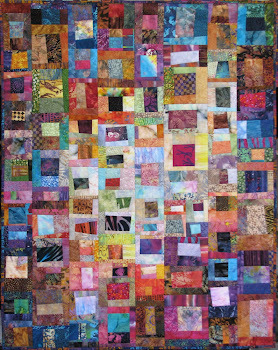 I love butterfly quilts. And with Kaffe fabric, it will be stunning. Organization DOES matter - you are living proof and your quilts demonstrate the results! Gorgeous eye candy in those photos! Cutting two at once is impressive. Those prints are so beautiful!